Please visit our website and download the DOWIN Gasoline Horizontal Engine Catalogue 2011 (575KB) at CONTACT US / Catalogues Download. REFERNCE FEATURES *Ranging from 2.5hp to 17.5hp. *Horizontal shaft. *Single cylinder, forced air-cooled, 4-stroke, OHV Over-Head Valve. *(T.C.I.) non-contact transistorized ignition system *Oil alert system. *Easy start with electric start or recoil manual hand start. *Low oil consumption, low noise and pollution. *PTO: key shaft, thread shaft, taper shaft *High power dynamics and performance. *Reliable and durable. *Compact and lightweight. *Easy service and maintenance. Product Specification/Models GX series engines with oil alert system, forged alum. crank case, full steel camshaft and crankshaft, Huayi carburetor,OEM brand design and custom-fit production, 1 year factory original warranty. 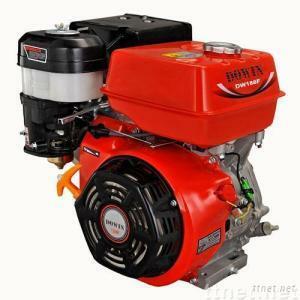 WILDLY APPLICATION FOR Gasoline generator sets, gasoline water pumps, high pressure washers, lawn mowers, power tillers, contruction machines and other power machines and equipments.